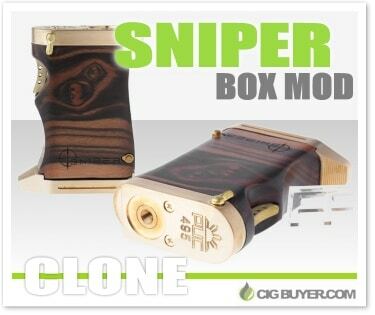 The Sniper Box Mod is a great looking mechanical box mod made out of wood and brass. It has an comfortable ergonomic grip and a trigger-style firing button mounted on the side, with locking mechanism. Pressing the bottom button releases the battery cartridge, which holds two 18650 batteries. It includes copper battery contacts and a recessed 510 connection with adjustable center pin.